I’ve seen a lot of talk around the blogosphere this month about the exploitation of pink and breast cancer awareness by big brands just looking to make a little cash under the guise of supporting the breast cancer fight and cause. I’m sure that may be the case with some companies but whatever it is, I’ll still support products whose purchase donates to fighting breast cancer because otherwise my option is buying something that doesn’t. 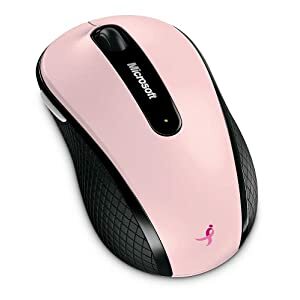 Here’s one product — Microsoft’s Wireless Mouse 4000 in Pink — that donates $4 to Susan Komen with every purchase: from September 2010 through September 2011, Microsoft will donate $4 towards the Susan G. Komen Foundation with a minimum donation promise of $200,000. It’s $34.99 on Amazon with free shipping. This link is an affiliate link too – meaning a small percentage of the sale goes to Mommies with Style but does not effect the donation. If you don’t want to use my affiliate link, you can visit Amazon and search for this product. I am so happy to see so many companies going “PINK”..I am aware that some is for publicity but I also think that as women we are being recognized as the “powerful” source that we are! !